European engineers test-fired the world’s most powerful present-day single-segment solid rocket booster Monday in French Guiana, clearing a major development hurdle for the Vega-C and Ariane 6 launchers set for debuts in 2019 and 2020. 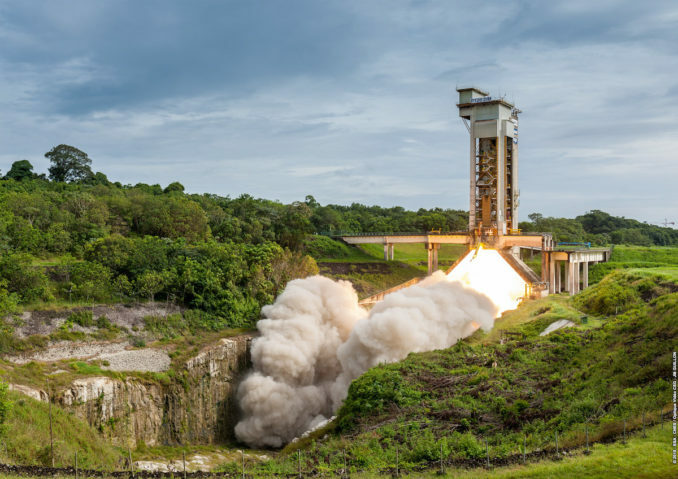 Mounted on a test stand over a flame trench carved out of bedrock at the European-run spaceport in South America, the P120C rocket motor fired at around 1200 GMT (8 a.m. EDT; 9 a.m. French Guiana time) Monday after bad weather delayed the test from last week. The rocket motor consumed its supply of more than 300,000 pounds (142 metric tons) of solid propellant in 135 seconds, generating around 800,000 pounds of thrust at full power in a sea level atmosphere. Engineers used the test-firing to collect about 600 points of data on the rocket motor’s thrust, internal pressure, temperatures, and other performance metrics. The results from Monday’s hotfire test will help designers confirm the rocket’s performance matches expectations. “No anomalies were seen and the performance met expectations, though full analysis will take several months,” the European Space Agency said in a statement. Burning a pre-packed rubber-like solid propellant mixture called HTPB, the P120C will be used as the first stage of Europe’s new Vega-C rocket set to enter service late next year. The Vega-C is an upgraded, higher-performing version of the Vega launch vehicle, which has logged 11 straight successful flights since its debut in February 2012. Europe’s next-generation Ariane 6 rocket, scheduled for a maiden test flight in July 2020, will fly with two or four P120C rocket motors as strap-on boosters, allowing engineers to adjust the launcher’s lift capability depending on the weight and destination of its payload. The P120C motor is derived from the Vega rocket’s P80 first stage motor, itself an evolution from the strap-on boosters used on Europe’s heavyweight Ariane 5 rocket. The P120C’s carbon fiber casing is manufactured by Avio in Colleferro, Italy, near Rome, and its nozzle is produced at Ariane Group’s Le Haillan site near Bordeaux, France. Ariane Group is a 50-50 joint venture between Airbus and Safran, and the principal owner of the launch services company Arianespace. The major components were shipped to French Guiana, and the developmental motor fired Monday was assembled and filled with solid propellant at a fueling plant at the Guiana Space Center, then rolled out to the test stand on rails last month. “The success of the P120C static firing test is a key milestone on the Vega-C and Ariane 6 development programs in view of the launchers’ maiden flights schedule for 2019 and 2020, respectively,” said Giulio Ranzo, Avio’s chief executive. The P120C rocket motor measures 44 feet (13.5 meters) tall and 11 feet (3.4 meters) in diameter. It contains nearly twice the propellant carried by the P80 rocket motor, and provides an increase in thrust of roughly 50 percent over the currently-flying P80. By comparison, the Ariane 5 rocket’s twin strap-on solid-fueled boosters each produce around 1.2 million pounds of thrust at sea level, more than the P120C. But the Ariane 5’s boosters come in three heavier steel pieces, or segments, and are more expensive to manufacture. High-power five-segment solid rocket boosters designed to fly on NASA’s Space Launch System generate more than 3 million pounds of thrust. Two qualification test-firings of the P120C rocket motor are planned at the end of this year and in 2019 before the inaugural flight of the Vega-C rocket. The Vega-C will be the first vehicle to incorporate the P120C solid rocket motor. The uprated version of Europe’s Vega launcher will be able to loft up to 4,850 pounds (2.2 metric tons) to a 435-mile-high (700-kilometer) polar orbit, an improvement over the Vega’s current lift capability of around 3,300 pounds (1.5 metric tons) to the same orbit, according to the European Space Agency. Officials intend for a launch of the upgraded Vega-C rocket to cost no more than the baseline Vega booster, which has achieved success in luring contracts for launching small Earth observation satellites. 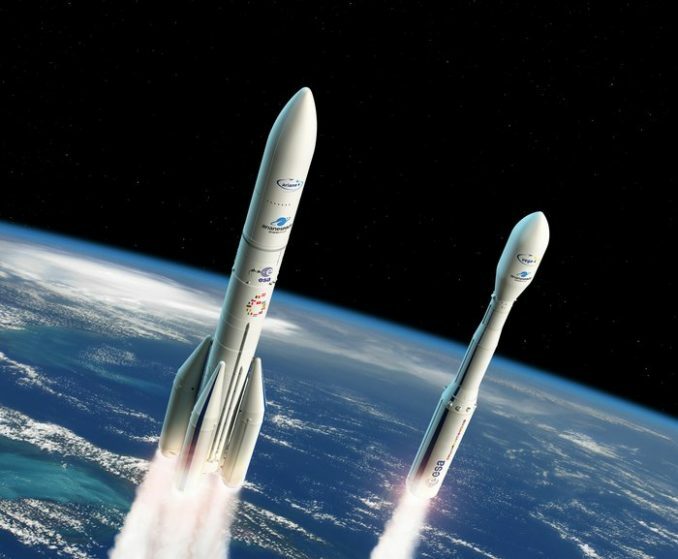 Arianespace is also eyeing the rideshare launch market for future Vega flights. The Vega-C will also debut an enlarged second stage motor, called the Zefiro 40, which was successfully test-fired in Sardinia for the first time in March. Europe’s Ariane 6 rocket will use two or four P120C boosters mounted around the launcher’s hydrogen-fueled core stage. A test version of the Ariane 6’s Vulcain 2.1 main engine, based on the Ariane 5’s Vulcain 2 powerplant, completed its first hotfire demonstration on a test stand in Germany in January. The development of both rockets is funded in public-private partnerships between the European Space Agency and industry, mainly Ariane Group and Avio, with the objective to provide Europe with an independent strategic launch capability, while attracting continued commercial launch business for Arianespace. 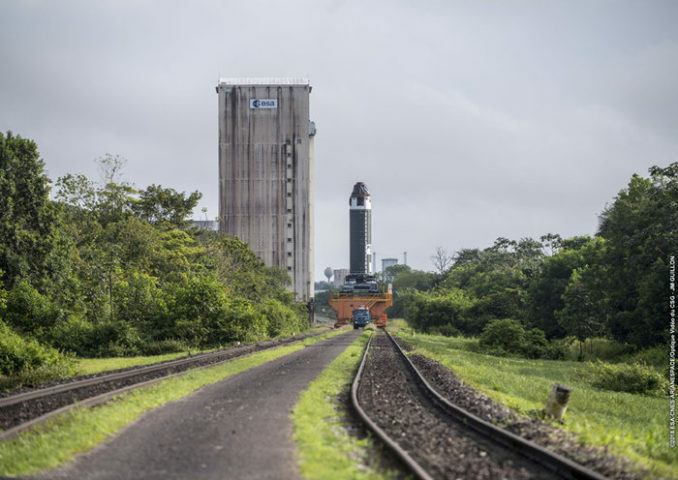 The Vega-C and Ariane 6 rockets will blast off in French Guiana from launch pads a few miles away from the test stand used for Monday’s P120C hotfire. With the projected launch rates of the Ariane 6 and Vega-C rockets, Avio says it will produce up to 35 P120C motor casings per year at its Colleferro manufacturing facility. European officials say the shared solid motor production line will help bring down Ariane 6 and Vega-C launch costs as Arianespace faces stiff competition from private launch companies like SpaceX.